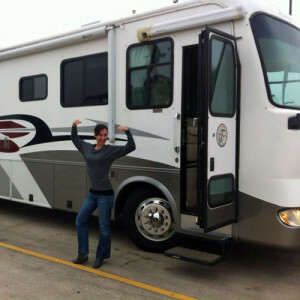 For roughly three years Eric and Brittany Highland had been dreaming about purchasing an RV. In January 2014 they finally pulled the trigger with no practical RVing experience whatsoever. On February 22, 2014, they started the full-time RV lifestyle. Now they're traveling all over the United States on the adventure of a lifetime, exploring small towns, state parks, cultural destinations and delicious holes-in-the-wall. 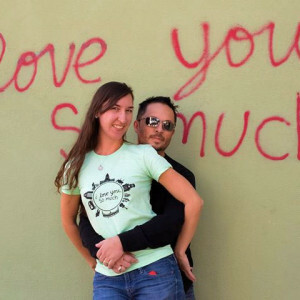 They work while on the road, maintaining the Austinot, one of Austin, Texas' top food and culture blogs, as well as relationships with their marketing clients. Their travel companions are Meriwether, a 2004 40' Tiffin Phaeton diesel RV, Smaug, their 2006 Jeep Commander, and Trogdor the Burninator, a five-year-old Sandfire Bearded Dragon. Ardent Camper became an RV Wanderlust groupie in March and loves Eric and Brittany's inspiring lifestyle and playful, can-do attitude. 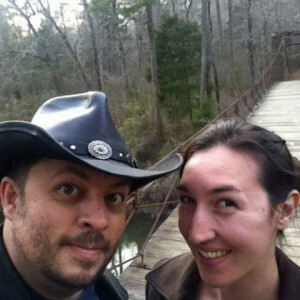 You can follow their adventures and find helpful tips for becoming a digital nomad at RVWanderlust.com. Members of Ardent Camper's mailing list already got to preview part of this article. Join our monthly newsletter so you, too, can get a sneak peek at exclusive content! AC: So where are you guys from? EH: From the womb of our respective mothers and the gleam in our respective daddies' eyes. Ok, well we wanted to start the interview off with a bang. But truth be told, though we're both Texans at heart, Brittany was born in Sarnia, Ontario, Canada and I was born and raised mostly in Seattle, Washington. AC: Did you travel a lot growing up? EH: We've both done quite a bit of traveling. Brittany's family did regular road trips from their new home in Texas to as far as the Northwest Territories, within the Arctic Circle, to visit extended families. Yes, all that way by car. I was in the United States Coast Guard for 20 years and have traveled all over the world. I've even been to Antarctica twice and the Arctic Ocean three times. I've been fortunate to step foot on every continent except Africa, but it's on my bucket list. AC: Who came up with the idea first? EH: I came up with the idea first, but it was more of a passing thought, a dream of sorts. I remember one night in our little Austin apartment when Brittany looked at me and said, "I'm ready to do this. Let's do it." From there, it was just a matter of working through the process. AC: Can you take me through the steps you took, from the first glimmer of an idea to actually hitting the road? EH: A lot of discussion, dreaming and research went into those three years. In short, here are the steps we took. Narrowed down the type of motorhome we wanted to purchase (2013) AC note: you can read more about this decision here. AC: How's Trogdor liking it? EH: Trogdor seems to be adapting just fine. For those few beardie owners who might see this, make sure you keep the stress on them as little as possible during transitions. We put Trogdor in a carrier while we are driving and then back in his terrarium when we get settled so he associates his home with safety. 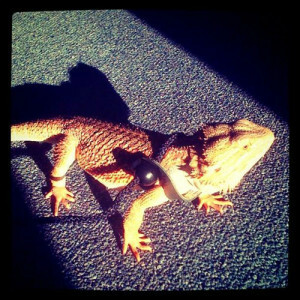 Eric claims Trogdor "has to be one of the most cultured bearded dragons on the planet." AC: How's digital nomadism working out for you? Are you usually able to find wi-fi? EH: Not always. Obviously the closer to a major city we are, the better the wi-fi is. We have a Millenicom plan with a Pantech MHS291L, which has been working out great for us. It does have a data cap, so we use campground wi-fi when available, or find a local Starbucks or other place with free wi-fi when we want a change of scenery. AC: What's your typical day like? EH: We work for ourselves and have a handful of long-term clients who we're really thankful for. We do social media management, content writing and consult in other areas of online marketing through our company Knektion. In addition, we run the Austinot and now RVWanderlust, so you can imagine that we're pretty busy during the work week. For us a typical weekday involves working from 8-4, then exploring our latest location. We're history buffs and foodies, so we spend a lot of time going to historical sites and finding great local food joints. The weekends are usually when we drive to our next destination — much less traffic and no interference with work. AC: Your food posts look awesome. How often do you eat out versus cooking? EH: Thanks! We love to eat out and discover hole-in-the-wall-type joints. As far as how often, it's all about budget. We're rich in life and lifestyle, but just average in income. So our budget really dictates how often we can eat out — usually a couple of dinners out each week. AC: What's it like living in super close quarters? EH: As a sailor, I spent a lot of time on ships and in close quarters. My "stateroom" now is much nicer than any ship I've ever been on. Brittany is a minimalist, so it's a good fit for her too. Sometimes we get a little stir crazy, so we just hop in Smaug and go exploring. There is never a shortage of new things to discover with this lifestyle. AC: What's the hardest thing you've had to do so far? EH: A three-point turn in Meriwether in really tight quarters. We were following Google maps and it led us astray. I found this driveway that looked long enough for me to turn around in, and it was. Except for the two mailboxes that I took out in the process. $75 and a friendly chat with a Mississippi man later, we were on our way in the right direction. AC: What's the best thing you've experienced so far? EH: Mr. D., at the Old Country Store in Lorman, Mississippi, serenaded Brittany with "Sugar Pie Honey Bunch." 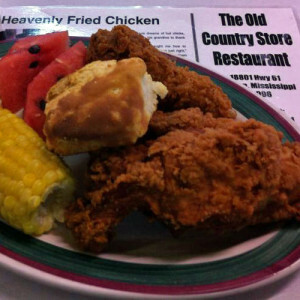 He was quite a character and made fried chicken that would make both Col. Sanders and your grandmama jealous! BH: All those "we're doing it" moments have been really special. It's still bizarre to be working full-time, doing the same things professionally we were back in Austin, but be traveling the country in our off-time and seeing things we never would have seen otherwise. 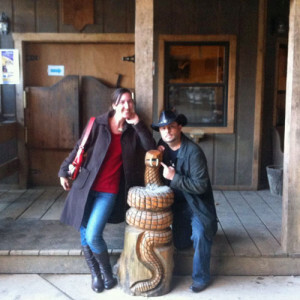 Rattlesnake Saloon in middle-of-nowhere, Alabama was a spontaneous adventure. We had to take a 4x4 truck down a steep hill into a canyon, where a restaurant/bar sat inside a cave! Good food, all the sweet iced tea we could drink, and even karaoke serenades from the locals. Quite the experience. AC:You're going all over the place! Where are you especially looking forward to visiting? EH: I'm really looking forward to some time in Florida somewhere in the near future. I'm a tropical person, and I like it warm and sunny! I'd really like to spend some time close to St. Augustine. It is such a great little city. BH: I can't wait to take Eric to Sagamore Hill on Long Island, the home of Former President Theodore Roosevelt. AC:If Meriwether could travel anywhere in the world, where would you go? EH: Anywhere in the world? We would both love to RV all over Europe. If anyone reading this wants to sponsor that trip, we'll gladly create a blog just for it and plaster your name all over the side of our rig. AC: I know you just got started, but you've already accumulated lots of wisdom. What's the best advice you can give to others who want to live and work on the road? EH: Don't get so busy making a living that you forget to make a life. If you are thinking about doing the RV thing full-time, take the shot. You only get one trip around, and why not actually take the trip? Life is too short not to make the most of it. Think about this fable for a moment: There are three frogs on a log. Two make a decision to jump off. How many frogs are on the log? The answer is three. Just because you make a decision, doesn't mean you take an action.There are two kinds of people in this world: those who talk about doing things and those who do them. We hope to always fall into the latter category and suggest that anyone reading this does too. AC: Anything else you'd like to add? EH: Just wanted to say thank you to Ardent Camper for asking us to share our story. It's just getting started. We ask that you give us a follow on Facebook and on Twitter and that you stay in touch with our adventures on our main website, RVWanderlust. We love to meet people and have fun, so don't be shy! If we're in your area and you'd like to show us that favorite hole-in-the-wall spot in your neighborhood, we're down like a submarine! ← Trail Beverages: What's on the Menu?